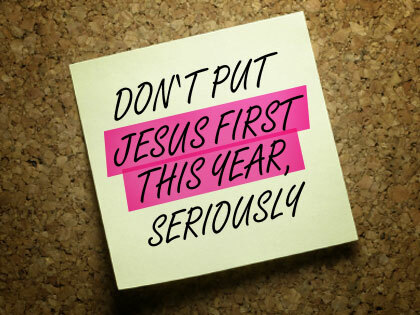 Don’t put Jesus first this year. Before you label me a heretic, let me explain. I imagine many of you are going through a similar process as me right now of setting and resetting your priorities. Personally, I love this time of year. I’m a very goal-oriented individual, and I’ve found reprioritizing and recalibrating your life is an indispensable activity if you really want to actualize your potential. And here’s what it usually looks like: We start by putting Jesus at the top. Then family. Then maybe career. And so on. However, I’ve found this isn’t very effective when you get down to the grind of everyday life. For example, what does it even mean to put Jesus before my family? Do I ignore my family to spend more time with Jesus? Or with your career, do you stop working to put Jesus first? The essential problem with this approach is it segregates the different priorities of life. You end up removing Jesus from where you spend the majority of your time and putting Him on an island by Himself. The biggest island maybe, but an island nonetheless. I don’t think this is the way it was ever supposed to work. Colossians 1:15-20 repeatedly tells us Jesus is first before and over everything. But it also says all things were created through and for Him. That in Him all things hold together. That the goal of the cross was to reconcile all things to Himself. Steven Furtick is the founder and lead pastor of Elevation Church. In just under seven years, Elevation Church grew to more than 12,000 people in weekly attendance, meeting at seven locations in the Charlotte, North Carolina area. Elevation has been named one of the fastest growing Churches in America by Outreach Magazine for each of the past six years. Pastor Steven has been privileged to minister to a global audience, speaking at conferences and churches around the world, including Catalyst Conference, Hillsong Conference, and the Willow Creek Global Leadership Summit. He is the author of the best selling book “Sun Stand Still” and the New York Times Best-Selling follow-up, “Greater.” Pastor Steven holds a Master of Divinity degree from The Southern Baptist Theological Seminary. He and his wife Holly live in the Charlotte area with their two sons, Elijah and Graham, and daughter, Abbey.